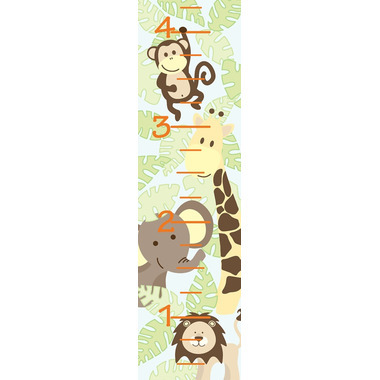 This WallPops peel & stick Jungle Friends Growth Chart is an adorable and fun way to measure the years. 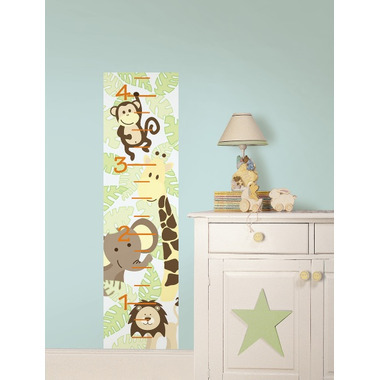 Place this cute wall decal, featuring jungle animals like an elephant and a monkey, on the wall for an adorable height chart. This functional and stylish safari wall sticker will not damage your walls and is totally removable and repositionable if you re-decorate! Contains a single 48" x 13" sheet. This is really cute - I wish I had gotten it sooner. It was very forgiving during application to a glass door. I was able to move it around a bit until I was happy with the placement. I'm not sure how it will fare if later I move it to a wall, for example, but time will tell. I'm also not sure how I will transport it if we are moving. I saved the backings and plan to try re-applying it to those but again, we'll see how that goes.